It has been nearly a year since I posted on this blog, in the fevered anguish so many of us felt after the election and inauguration of America’s current glorious leader. After that, I lost the heart to write and I filled my time with teaching and and social media, that succubus. But I miss writing. 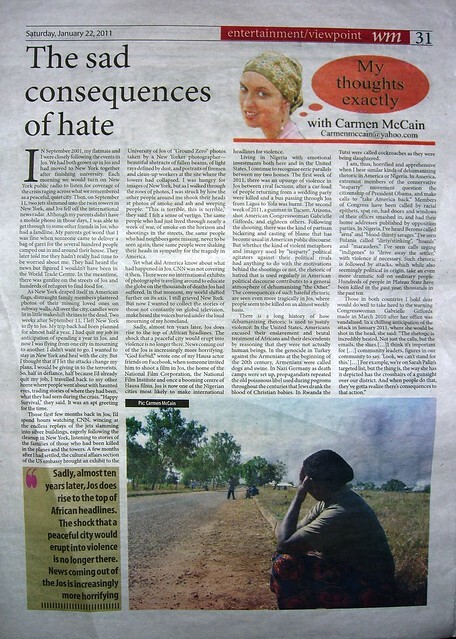 I miss my column in Daily Trust. And because I have no urgent deadline, I write very little these days, at least writing for myself. I do try to eke out what academic writing I need to get the job done. But, because I am not exercising my writing muscles, what I write is creaky and awkward. Tonight, I was looking through my photos for one such academic project. I have thousands of photos, hidden in thousands of files on my laptop. And I have often thought that I should give myself a blog assignment of posting a photo a day and to write about the memory that rushes to mind. A photo a day is probably much too ambitious, so I will merely say that I will try to post more often, and I will try to look at my photos more often, and I will let myself remember and write more often. It is 2am here, but I have determined to do this, so let’s go. So for today’s photo I went back to 5 November 2011. Only a few months earlier I had moved from Kano to Jos to try to work full time on my PhD dissertation. But in late October I went back to Kano for the Goethe Institut premiere of Duniya Juyi Juyi, a film produced by the researcher Hannah Hoechner but written, directed, and acted in by almajirai. I see, via my photos, that this was also the first time I saw my friend Sa’adatu Baba Ahmed’s newborn daughter, who is now a big girl of seven. Feeling keenly my lack of training in acting and the exaggerated American accent I had put on after years of being back in Nigeria, I actually dreaded seeing this for years. It received 6 nominations at the 2013 Africa Movie Academy Awards–the first Hausa film to be honoured as such by AMAA. I finally saw it at a screening at KABAFEST, the Kaduna Book and Arts Festival put together by Lola Shoneyin this summer, and the film blew me away. Fortunately, my part is very small, and Sadiq Sani Sadiq and Nafisa Abdullahi carry the film with their powerful understated acted. It is a quiet, moving film about the ordinary people behind the sensational headlines that make up history. It’s not as experimental as Gyang’s film Confusion Na Wa, but it’s just as striking. I should write more, but it is much too late, and I have more academic writing and class preparations to do to tomorrow. But let this serve as a start. I will post more. Even all these years later, seeing the date September 11 still gives me a small jolt. Last night I was up past midnight trying to put up a course syllabus online. When I glanced at the date in the top right-hand corner of my screen, I jumped a little. I was chatting with my brother online about a documentary on climate change we are working on, and I said, “oh my goodness I just saw that it was Sept 11.” “Yeah,” he said. Because remembering September 11, now, through a lens of fourteen years, I think of how America’s knee-jerk response, the war in Afghanistan and the war in Iraq, the years of bombings that often killed people as innocent as the ones working in those towers, ultimately led to rise of ISIS, maybe even Boko Haram. If we could go back to that time, if America had not gone to war, if we had investigated better, if we had responded less violently, what would the world look like now? Perhaps it is futile to play “what if” games, perhaps even worse things would have happened. But despite all the trauma of the day, since September 11, 2001, the world has been filled with bombs. Hundreds of them have gone off in Nigeria since 2010. I was closer to the Boko Haram bomb at the COCIN Headquarters Church in Jos on 26 February 2012 than I was to the World Trade Centre on September 11. Americans are loud in their grief, but elsewhere far more people have been killed than were in the towers, the planes, and the Pentagon on that blue-skied day in September fourteen years ago. Yet it remains an epochal day in the history of the world, the scale of it, and by what it precipitated in the world. I’ll post here a few of the other articles I’ve written about my experiences on September 11. I’ve revisited those memories many times over the years. Reading back over them, I am struck by how each time I remember, other details emerge, while others fade away. Here are three columns I wrote in 2011, around the ten year anniversary of the tragedy. Daily Trust has recently updated their website. The dedicated site for my column is gone, and almost all of my articles have their introductory paragraphs cut off now. I will try to slowly begin to archive them here on my blog from pre-edited copies that I submitted to my editor. The first article I will post here is on the event of the 10-year anniversary of the attack on New York published on 10 September 2011 and the second and third are from articles I had published in January of 2011. We were very young, and neither of us had any idea of the world that day was christening us into. As she proceeded to the subway, I quickly dressed and ran down to the pier on the Hudson River only a few blocks from where we lived, which had a clear view of lower Manhattan. In previous columns I have written about standing on the pier with other New Yorkers, mouths agape as we watched hot fire devour the centre of towers, white smoke pouring across the blue sky into Brooklyn. I’ve described how a ripple of smoke ran down the South Tower before we saw it collapse into dust, how I walked numbly away from the water back towards my apartment, through deserted streets, televisions blaring through open windows. By the time I got back home to the radio, the second tower had also fallen. I lay on my bed, hot tears trickling into my ears trying to calling my flatmate, another friend I thought had been in the tower, my aunts and uncles. All networks were busy. My flatmate got home around noon, covered in soot. She had not yet arrived at work when the train stopped. She had walked about 70 city blocks back home through the ash blowing across Brooklyn, holding a paper serviette from a deli across her mouth and nose. Later, we went back out together, down to the pier where I had seen the first tower fall. The sky was clear and blue and the afternoon sun, hot. Where the gleaming silver twin towers had once loomed over the skyline of lower Manhattan, there was nothing but smoke. Suddenly, we heard the sound of planes overhead. My body tensed. There was a no-fly order imposed. There were not supposed to be any planes in the sky. When we looked up, they were fighter planes. It was a symbol of what was to come. The next few days, we stayed at home and listened to the radio with two other friends who came to stay with us because they didn’t want to be alone. The couple who lived below us in the brownstone house were both newspaper editors, and one day I stayed with their children while they both went in to work. The children asked me why someone would fly planes into the World Trade Centre. I didn’t know what to tell them. “There are crazy people in the world,” I said. “There are bad people.” Around the city, family members posted photos of missing loved ones on subway walls and lamp posts. Small shrines sprung up around them, with candles and ribbons and letters. A bagpipe procession went past our window, as a funeral was held for a fireman at the Catholic church down the street. The Muslim shop owner around the corner from my house put up a gigantic American flag. Two weeks later I boarded my plane back to Nigeria, on my way to another wounded city, where my parents had hosted a refugee camp at their house, churches and mosques had been burnt, and one of my father’s students had been found murdered, washed up on the banks of a river. It felt, in those days, as if the whole world were on fire. Ten years later, both countries I call home are harsher more violent places. The U.S. has turned on itself. American extremists lash out against Muslims, who they blame en-masse for the attacks, filling the internet and airwaves with hatred. Al-Jazeera reports that in the past ten years the FBI has “investigated more than 800 violent acts against Muslims, Arab Americans, or people perceived to be of Middle Eastern origin.” The violent rhetoric in the U.S. does not stop at American borders. Norwegian terrorist Anders Behring Breivik, who killed seventy-seven people in a bomb and a shooting this July, cited American bloggers in his online manifesto. In the countries the U.S. invaded following the 9-11 attack the death toll is much higher, and such actions are used by violent extremists as justification for further violence. In Nigeria, the entity popularly called Boko Haram has, this year, initiated Nigeria’s first suicide bombs, only a few weeks ago attacking the UN building, which, like the World Trade Centre, represented the existing global system. Ten years after the first large crisis, Jos has become an appalling place. The first few crises may have been instigated by politicians, by “bad, crazy people” as I told my landlord’s children in the wake of 9-11, but is continued through communities seeking revenge. Those who were children at the time of the first crisis have grown up to become murderers, committing atrocities against those with whom they might have been friends had they lived in a different city, but whom they have been taught to despise. Parents and clerics and leaders who should be restraining them, encourage hate, or else refuse to speak because they are afraid their children will turn on them. One of my favourite writers C.S. Lewis imagines in his novel The Great Divorce, Hell, as a place where people continue for an eternity in the path they decided to follow on earth. Unforgiveness, hatred, and arrogance eat away all their good characteristics till they become shadows, left with nothing but the sins they refuse to give up. Given a chance to go to heaven, most of the ghosts in the novel return voluntarily to hell. In heaven they are unable to hold on to their hatred, and they’d rather live in hell than forgive. Ten years after the Jos crisis and the 9-11 attacks, I am only left with questions and fear for the future. What are our children learning? What are they becoming? What kind of world will we leave them? Where will we be in another ten years? Are we willing to do the hard thing, forgive those who have killed our loved ones and teach our children peace, or do we want to take revenge after revenge, until we have made for ourselves hell on earth? I thought I had just seen a friend die. I walked away, my hands on my head, dry eyed, my mind blank. As I walked back to my apartment, the streets were deserted. I could hear nothing but the sound of television news blaring out of open windows. Two construction workers I had passed on my way down to the water, ran past me. One dropped his helmet. “Leave it. Leave it,” screamed his parter. By the time I reached my apartment, I heard on the radio that the second tower had fallen. I lay on my bed, the sun travelling over me, trying to call my family (all networks were busy), waiting for my roommate to come home. I lost a friend that day—but not to the towers. The friend who had worked in the world trade centre complex was fine. I lost my friend to anger. “I hope they hunt down who has done this,” I emailed my friend living in distant Midwestern America. “And kill them.” “Why do you want to respond to violence with more violence?” he asked me. “If you couldn’t look them in the eyes and kill them yourself, you shouldn’t say you want them to be killed.” I was furious. What did he know, living far away in an untouched city where he couldn’t smell the smoke, where he couldn’t feel the grit of pulverized buildings and burned bodies floating through the windows and settling on everything like harmattan dust, where he hadn’t suffered the agony of thinking a friend had died, a neighbor had died. His pacifist ideas felt namby-pamby, ideal without experience. How could he preach to me, when he didn’t understand my grief. I wasn’t saying we should go out and kill innocent people. I was saying we should kill terrorists. I never wrote him back. I never spoke to him again. I flashed back to that day this week on New Year’s Eve, when I heard of the bomb that exploded in Abuja and the rumours of other bombs that turned out not to be true. I can understand now that there may have been more sense to my friend’s words than I gave him credit for. I regret losing a long friendship to anger. In anger, America went into a war they didn’t understand. They geared their action towards stereotypes rather than intelligence, and their actions have caused mass suffering and deaths far beyond what we Americans suffered on September 11. Yet, although I never supported the war in Iraq, I can understand the anger that made other Americans support it. I do believe that international law should be followed in bringing justice, but I still understand why I reacted so violently to my friends glib pacifism, which did not seem to take seriously the massive suffering caused by those who hijacked planes and brought down towers. It is true. I am white and the citizen of a superpower. My country has thrown its weight around the world. I can never completely understand the feeling of powerlessness, the feeling that there is nowhere else to go—or the very personal history of oppression. But I do know what it feels like to live in a city under attack, both in New York and in Jos. I have experienced terror attacks in America and lived through multiple crises in Nigeria. I have close friends who are Christians and Muslims in Jos, Kano, Abuja, Kaduna. I have seen the anger on both sides. And I know that it is not my friends, it is not the ordinary people who have committed acts of terror. But it is the ordinary people who suffer when angry people take the law into their own hands. It is the ordinary people whose houses are burnt and brothers and sisters and fathers and mothers and children are killed in the violence of retaliation. 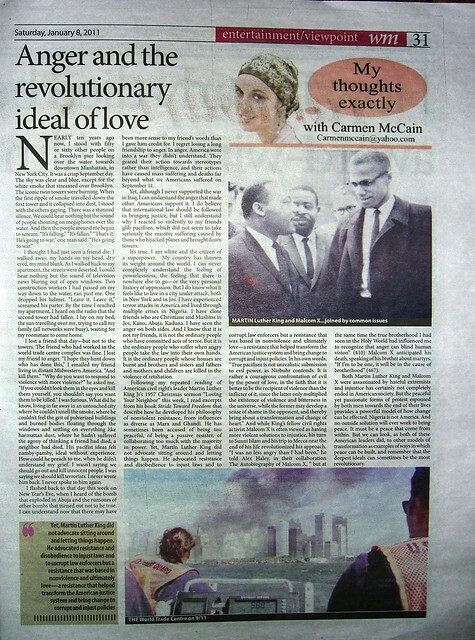 Following my repeated reading of American civil right’s leader Martin Luther King Jr’s 1957 Christmas sermon “Loving Your Enemies” this week, I read excerpts from his book Stride Toward Freedom that describe how he developed his philosophy of nonviolent resistance, from influences as diverse as Marx and Ghandi. He has sometimes been accused of being too peaceful, of being a passive resister, of collaborating too much with the majority in power. Yet, Martin Luther King did not advocate sitting around and letting things happen. He advocated resistance and disobedience to injust laws and to corrupt law enforcers but a resistance that was based in nonviolence and ultimately love—a resistance that helped transform the American justice system and bring change to corrupt and injust policies. In his own words, “True pacifism is not unrealistic submission to evil power, as Niebuhr contends. It is rather a courageous confrontation of evil by the power of love, in the faith that it is better to be the recipient of violence than the inflicter of it, since the latter only multiplied the existence of violence and bitterness in the universe, while the former may develop a sense of shame in the opponent, and thereby bring about a transformation and change of heart.” And while King’s fellow civil rights activist Malcom X is often viewed as having more violent solutions to injustice, his turn to Sunni Islam and his trip to Mecca near the end of his life revolutionized his approach. “I was no less angry than I had been,” he told Alex Haley, in their collaboration The Autobiography of Malcom X, “ but at the same time the true brotherhood I had seen in the Holy World had influenced me to recognize that anger can blind human vision” (410). Malcom X anticipated his death, speaking with his brother about martyrs. “If I’m to be one, it will be in the cause of brotherhood” (467). Both Martin Luther King and Malcom X were assassinated by hateful extremists, and injustice has certainly not completely ended in American society. [UPDATE: In 2015, with the constantly reported killings of young black men at the hands of the police, this becomes particularly clear.] But the peaceful yet passionate forms of protest espoused by both men towards the end of their lives provides a powerful model of how change can be effected. Nigeria is not America. And no outside solution will ever work to bring peace. It must be a peace that come from within. But we can look, as both of these American leaders did, to other models of transformation as examples of ways in which peace can be built, and remember that the deepest ideals can sometimes be the most revolutionary. 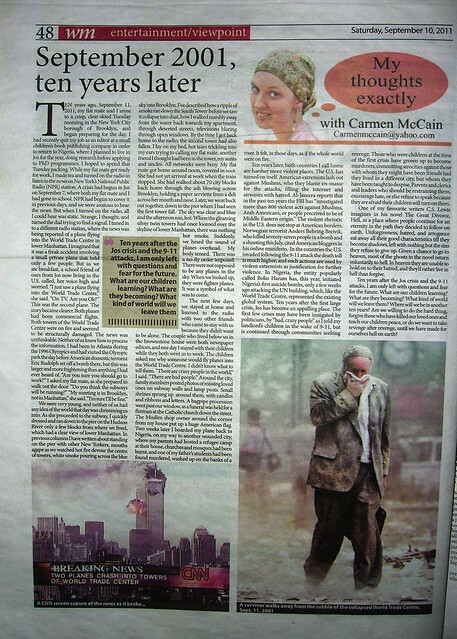 In September 2001, my flatmate and I were closely following the events in Jos. We had both grown up in Jos and had moved to New York together after finishing university. Each morning we would turn on New York public radio to listen for coverage of the crisis raging across what we remembered as a peaceful, quiet city. Then, on September 11, two jets slammed into the twin towers in New York, and Jos fell off the international news radar. Although my parents didn’t have a mobile phone in those days, I was able to get through to some other friends in Jos, who had a landline. My parents got word that I was fine when someone came to deliver a bag of garri for the several hundred people camped out in and around their house. They later told me they hadn’t really had time to be worried about me. They had heard the news but figured I wouldn’t have been in the World Trade Centre. In the meantime, there was gunfire on the streets of Jos and hundreds of refugees to find food for. As New York draped itself in American flags, distraught family members plastered photos of their missing loved ones on subway walls. All over the city, candles were lit in little makeshift shrines to the dead. Two weeks after September 11, I left New York to fly to Jos. My trip back had been planned for almost half a year. I had quit my job in anticipation of spending a year in Jos, and now I was flying from one city in mourning to another. I didn’t want to go. I wanted to stay in New York and heal with the city. But I thought that if I let the attacks change my plans, I would be giving in to the terrorists. So, half in defiance, half because I’d already quit my job, I travelled back to my other home where people went about with haunted eyes, trading stories of where they had been, what they had seen during the crisis. “Happy Survival,” they said. It was an apt greeting for the time. Those first few months back in Jos, I’d spend hours watching CNN, wincing at the endless replays of the jets slamming into silver buildings, eagerly following the cleanup in New York, listening to stories of the families of those who had been killed in the planes and the towers. A few months after I had settled, the cultural affairs section of the US embassy brought an exhibit to the University of Jos of “Ground Zero” photos taken by a New Yorker photographer—beautiful abstracts of fallen beams, of light rays defined by dust, and portraits of firemen and clean-up workers at the site where the towers had collapsed. I was hungry for images of New York, but as I walked through the rows of photos, I was struck by how the other people around me shook their heads at photos of smoke and ash and weeping people. “This is terrible, this is terrible,” they said. I felt a sense of vertigo. The same people who had just lived through nearly a week of war, of smoke on the horizon and shootings in the streets, the same people who had neighbors gone missing, never to be seen again, these same people were shaking their heads in sympathy for the tragedy in America. Yet what did America know about what had happened in Jos. CNN was not covering it then. There were no international exhibits of photography travelling around to educate the globe on the thousands of deaths Jos had suffered. In that moment, my world shifted further on its axis. I still grieved New York. But now I wanted to collect the stories of those not constantly on global television, make heard the voices buried under the loud mourning of my homeland. Sadly, almost ten years later, Jos does rise to the top of African headlines. The shock that a peaceful city would erupt into violence is no longer there. News coming out of the Jos is increasingly more horrifying. “God forbid,” wrote one of my Hausa actor friends on Facebook, when someone invited him to shoot a film in Jos, the home of the National Film Corporation, the National Film Institute and once a booming centre of Hausa films. Jos is now one of the Nigerian cities most likely to make international headlines for violence. Living in Nigeria with emotional investments both here and in the United States, I continue to recognize eerie parallels between my two homes. The first week of 2011, there was an upsurge of violence in Jos between rival factions, after a car-load of people returning from a wedding party were killed and a bus passing through Jos from Lagos to Yola was burnt. The second week of 2011, a gunman in Tucson, Arizona, shot American Congresswoman Gabrielle Giffords, and eighteen others. Following the shooting, there was the kind of partisan bickering and casting of blame that has become usual in American public discourse. But whether the kind of violent metaphors and imagery used by “teaparty” political agitators against their political rivals had anything to do with the motivations behind the shootings or not, the rhetoric of hatred that is used regularly in American political discourse contributes to a general atmosphere of dehumanizing “the Other.” The consequences of such hateful rhetoric are seen even more tragically in Jos, where people seem to be killed on an almost weekly basis. There is a long history of how dehumanizing rhetoric is used to justify violence. In the United States, Americans excused their enslavement and brutal treatment of Africans and their descendents by reasoning that they were not actually human beings. In the genocide in Turkey against the Armenians at the beginning of the 20th century, Armenians were called dogs and swine. In Nazi Germany as death camps were set up, propagandists repeated the old poisonous libel used during pogroms throughout the centuries that Jews drank the blood of Christian babies. In Rwanda the Tutsi were called cockroaches as they were being slaughtered. I am, thus, horrified and apprehensive when I hear similar kinds of dehumanizing rhetoric in America or Nigeria. In America, extremist members of the conservative “teaparty” movement question the citizenship of President Obama, and make calls to “take America back.” Members of Congress have been called by racial epithets, spat on, had doors and windows of their offices smashed in, and had their home addresses published by opposition parties. In Nigeria, I’ve heard Beroms called “arna” and “blood-thirsty savages.” I’ve seen Fulanis called “dirty/stinking”, “hoards” and “marauders.” I’ve seen calls urging “indigenes” to “drive away the settler,” with violence if necessary. Such rhetoric is followed by attacks, which while also seemingly political in origin, take an even more dramatic toll on ordinary people. Hundreds of people in Plateau State have been killed in the past year, thousands in the past ten.